The blend of these spices are so great. I never use to put anything on my steaks. 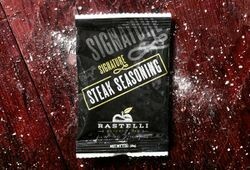 I'll never eat another steak I make without this !!!!! Best seasoning ever. Please sell on QVC!!!! I have ordered steaks on QVC. I usually don't put anything on my steaks but since the Rastelli seasoning was included I thought I would try it. WOW it was GREAT !!!!!! I will never eat a steak without it. I just looked on QVC to order more of the seasoning, but they don't have it. So I will get it from this Rastelli website. I would like to request you sell a container of it on QVC.